Agadir is a lesser known city when it comes to tourists, but is just as striking as many other Moroccan locales. Bordering the sea with views of red canyons, Agadir is a hidden gem for those who want to escape into nature, and of course, stay in lavish hotels. Home to gorgeous accommodations that will make guests feel like a sultan, the city is becoming a place to be to get a taste of the good life. 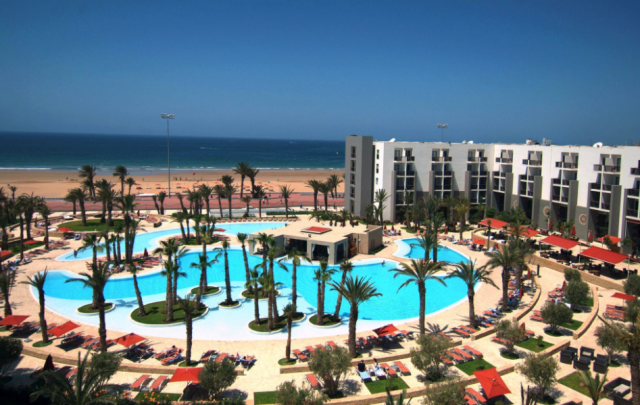 Here are the best luxury hotels in Agadir, Morocco. Drive up to this swanky hotel and you’ll know you’re in for a real good time. 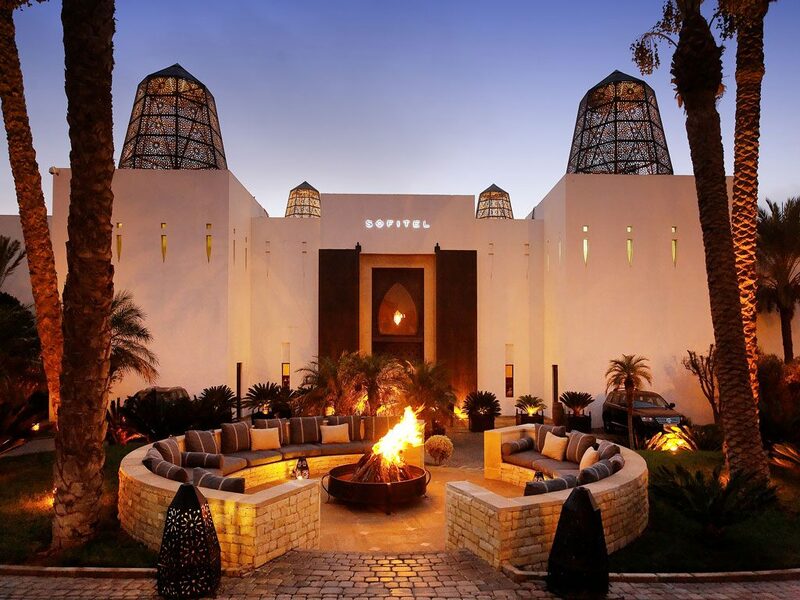 Sofitel Agadir Royal Bay Resort is known for its sleek, modern details with touches of Moroccan art found in lamps, paintings, and burnt orange furniture. The hotel is also conveniently located within steps of the sea, which means some of the rooms have incredible views of the Atlantic Ocean (be sure to ask for an ocean view when booking your room). 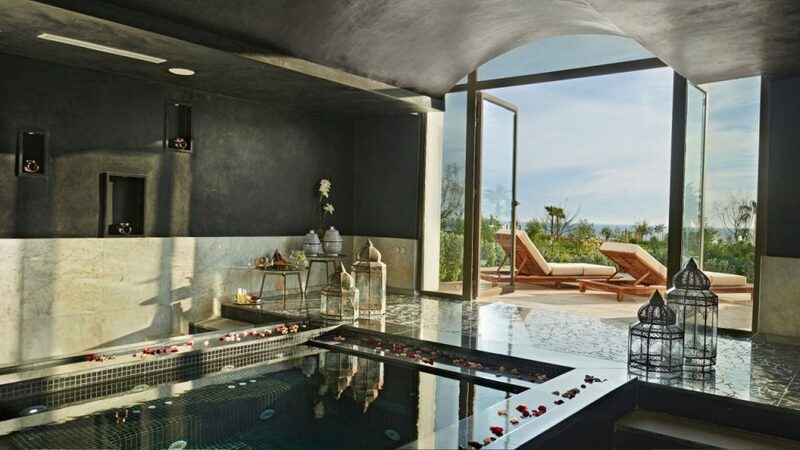 Services offered at the resort include a spa session using traditional argan oil while admiring the view of the ocean, a spacious luxury pool with your own personal butler, an outdoor lounge with a fire pit, and a late-night cocktail lounge. Not to mention, golf lovers will want to take advantage of its pristine golf course with the incredible view of Agadir in the backdrop. This resort is the place to be if you want to immerse yourself in the beach lifestyle. At Hotel Iberostar Founty Beach, there are several pools overlooking the Atlantic Ocean, surrounded by exotic plants and plenty of pool loungers. Step inside the white building and you’ll feel as if you’ve stumbled upon a royal palace with giant indoor pillars, gorgeous mosaic floors and arched doorways. Guest rooms tend to be more minimalist with murals of birds and spacious windows to invite the outside indoors. 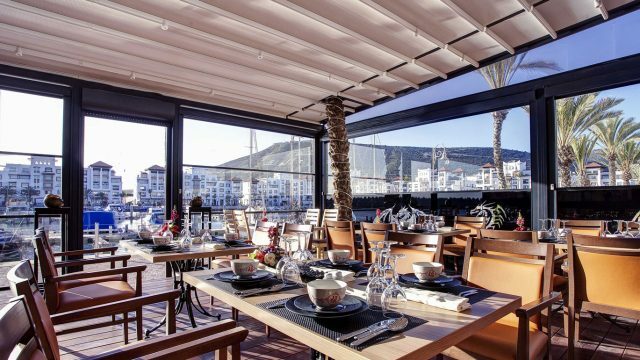 Visitors can have their meals at the hotel’s restaurant with a giant second-floor balcony that faces the ocean, or take it inside to admire the interior of modern art meets Morocco. If you prefer your hotel to be rich in royal colors everywhere you look, then you’ll want to consider staying at the five-star Royal Atlas Agadir. Expect to find strong usage of burnt sienna, Egyptian orange and eggplant purple on walls, comforters, drapes and furniture accompanied with luxury touches of crystal chandeliers and daily-made floral arrangements. Head outside and you’ll find a giant curved pool with palm trees scattered through the middle of the water and the ocean in the distance. Amenities offered at the hotel include a tennis court, golf course, horseback riding, canoeing, pedal boating, Turkish bath and more. For those of you toting along the kids, you’ll find a combination of luxury and family-fun activities at Bianca Beach Family & Resort. 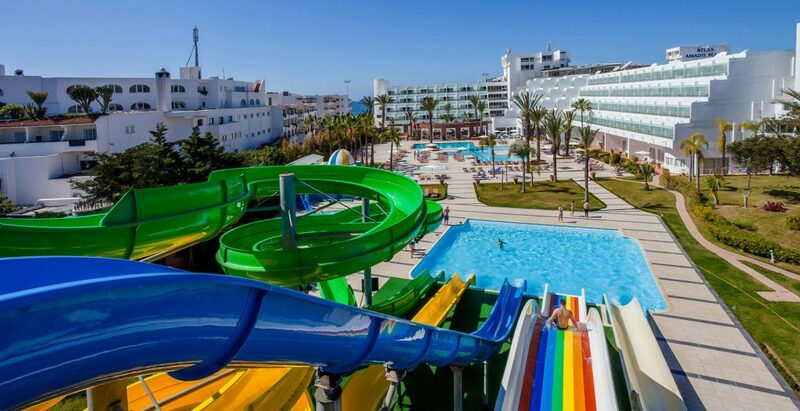 The hotel is located on a marina where guests will have their own private access to a beach while enjoying the perks of an amusement water park at their fingertips. This place is designed to cater to both children and adults, so families can take advantage of the kids’ play room, olympic-size swimming pool, and spa services. 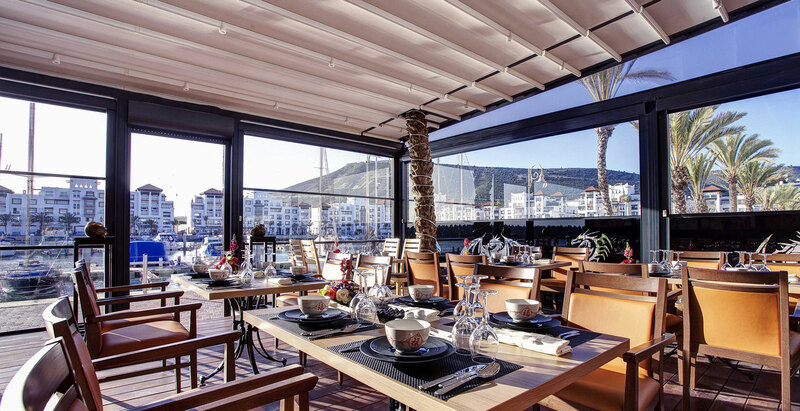 Make plans to have all of your meals here as there are plenty of restaurants including Sky Lounge with a 360 degree terrace view of the marina, Casa Mia for tapas, Navy Food Court (popular for kids with pizzas, fries and burgers), and Thai & Wok for authentic Asian cuisine. Taghazout Bay is a short drive outside of Agadir, but guests who want a secluded, luxury escape will go out of their way to stay at Hyatt Place while enjoying easy access to the city. Although Hyatt is a mega hotel chain, this place is designed to feel more like a boutique hotel despite having 172 rooms. Loaded with intricate details of rose petals on a reflection pool, wood art found throughout the facility, marble walls, and an outdoor bed right on its beach for guests to take in the full splendor of the ocean, Hyatt Place is where you want to be to get a full state of relaxation.